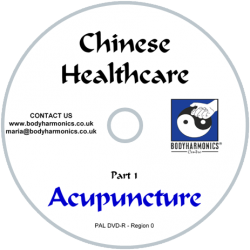 World renowned expert Maria Mercati has authored a series of books and DVD’s, clearly showing you how to practice and learn Acupuncture, Tui Na Chinese and Thai massage techniques at home available here in our online shop. Welcome to Bodyharmonics online shop. Check out our range of DVD's and books in our shop below. We ship to every country in the world. You’ll find our shipping costs are fair and reasonable. Postage & Packing rates are given for the UK, Europe and Overseas. Please note: All DVD's will be sent in PAL format except for Chinese healthcare also available in NTSC. Maria Mercati is the best selling international author of 166,000 copies of her Tui Na book which is excellent as an introduction to meridians and acupoints. The Tui Na DVD is teaches you the techniques and her unique routine. Her Thai Massage book has sold 110,500 copies and also has two accompanying DVD's to learn the techniques in action. Chinese Healthcare Traditional Chinese Medicine DVDS for Acupuncturists, Tui Na therapists, Herbalists, Qigong and Tai Chi practitioners Five part series on Traditional Chinese Medicine consisting of Acupuncture, Tui Na for adults and children Food & Herbs and Qigong & Tai Chi which was filmed in its own cultural context of 21st Century China. Maria's in-depth experience of first hand traditional medicine is unique and the footage that she acquired reflects this. Over the course of this series, she introduces a different way of overcoming and preventing illness. Watch this DVD sample featuring snippets from all 5 of the Chinese Healthcare DVDs. Why not try Tui Na or Thai Massage on your partner to get them really relaxed? Does your baby suffer from colic or sleepless nights? Try one of Maria's PROVEN DVD's to find that solution that will bring peace and calm to babies and parents alike! Unique baby gift ideas here!